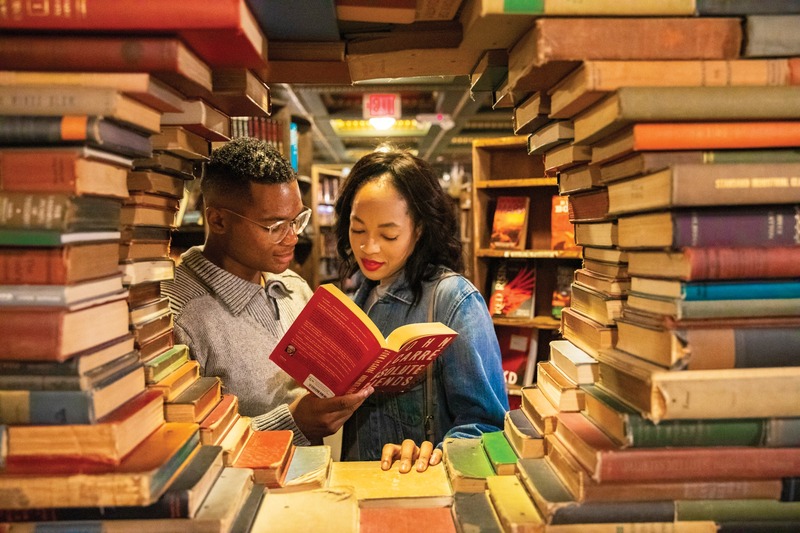 Located in downtown Los Angeles, The Last Bookstore is California’s largest new and used book and vinyl store, holding more than a quarter million books as well as Instagram-famous photo ops. The two-story bookstore includes books of all genres, the Arts & Rare Book Annex, the famous book tunnel through which visitors can walk, as well as thousands of vinyl records. Throughout the store, there are different photo backdrops, art pieces and shelving units that cause lines of visitors to form and wait for pictures. Malorie Gutierrez, freshman pre-nursing major, said she enjoys all that the bookstore offers visitors, even non-book lovers. “My favorite aspects were how aesthetically pleasing it was and how it seemed to have something for everyone. There weren’t just books and I really liked that,” Gutierrez said. Two famous photo spots are the stacks and an arrangement of books on the shelf that form a perfect circle through which visitors can peek. Becca Cooke, freshman marketing major, said she appreciates the separate rooms for some genres. “The Horror Vault was one of my favorite spots and it’s right next to the Wave of Books, which is a great place to get pictures,” Cooke said. These famous photo spots are all on the second floor of the bookstore and constantly have visitors lining up to get their postable picture before someone else gets in the way. The stacks are curved over a ramp leading to a new room and are made of hundreds of books lit up by LED lights, making it a good stop for any book lover. There is also a shelf on the second floor of books organized by color, creating a rainbow wall that many visitors take a picture in front of. The store also features studio stores from multiple local artists and companies, such as FOLD Gallery. At FOLD, they specialize in vintage cameras, typewriters and other collectable items from different eras. They also carry stationery, small gifts and other local merchandise from Los Angeles artists and companies. Jena Priebe, owner of FOLD Gallery, said her store aims to show a community in their close quarters with the Last Bookstore and other artists. “When first opening our store, we knew that we were part of a bigger community of artists and, of course, the Last Bookstore. It creates a deep sense of community. We are grateful to share the space with our artist neighbors and The Last Bookstore. In doing so, we create a unique energy where we all thrive and gain from being so close to one another,” Priebe said. Jaidyn Gillespie, freshman psychology major, said the store has much to offer college students, specifically. “The Last Bookstore has a lot to offer, from a surplus of newer and older books, it has beautiful artwork, as well as structures; it has an overall good spot for photo shoots, it has many different shops from different vendors who sell completely different things, it has a large number of records, and has insanely low prices, which is great for a college wallet,” Gillespie said.